Furnace filters play an important role when it comes to energy efficiency, the dirtier the filter the harder your furnace has to work. In fact, a new filter also keeps your air conditioner working smoothly, since your furnace works alongside your cooling system to circulate the conditioned air throughout your home. Having clean filters all year long is an important maintenance step. Keep the area around your furnace system clean by sweeping or vacuuming out dust and debris, and make sure nothing blocks the registers to maintain unimpeded air flow. Many parts of your furnace can become worn, or dirty over time and may need to be cleaned or replaced. Some of these items include: belts, pilot light, motor, bearings, and the burner assembly, especially if the furnace is an older model. Booking a professional inspection can help identify any required maintenance to keep your system running smoothly and safely. 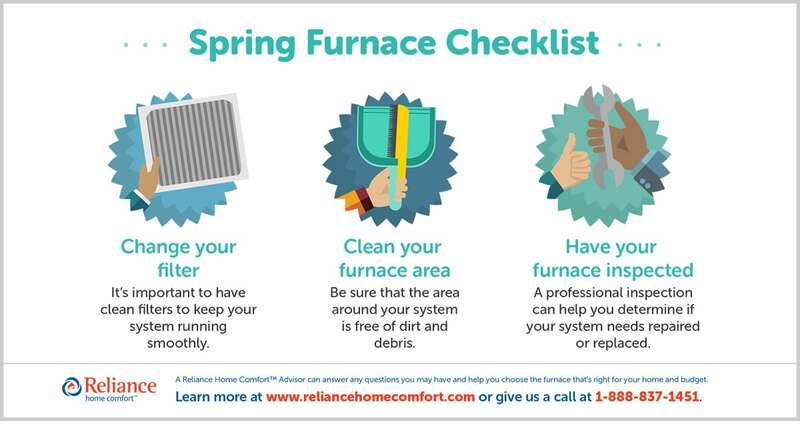 The spring is the best time to think about how well your furnace performed throughout the winter and whether you need repairs or should consider a replacement. Most well maintained furnaces should last for many years, so having your system checked & tuned-up by a certified heating professional can be one the smartest decisions you make for your home’s safety and comfort. Removing pollutants from the air in your home means you and your family can breathe cleaner.